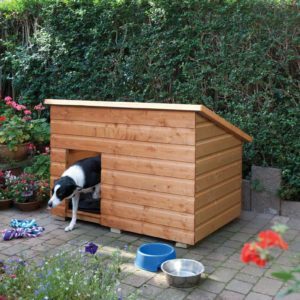 Made in the UK from honey brown dipped timber, these flat packed kennels are delivered to your door with self assembly instructions. Made from 12mm shiplap cladding and with mineral roofing felt. Suits large dogs or two small to medium sized dogs. With lifting lid and with lid stay for easy access. Opening can be cut into front or end. Dimensions: 0.94m h x 1380mm w x 900mm d. Price shown includes delivery. I would like to say another big thank you to the chaps who did a stunning job. I am really pleased with the finished gazebo. "What an excellent job you have done for us in putting the gates up and securing the garden so that it is puppy proof! I really appreciate the wonderful service and will certainly use Duncombe Sawmill again." "We are impressed with the quality of the fencing you supplied. It looks great and has transformed the paddock. Thank you." "We are very satisfied with the quality of the panels; the fence looks very nice."